Hello, dear blog friends! Today I'm posting for Really Reasonable Ribbon with a sweet card that I made a couple of weeks ago. 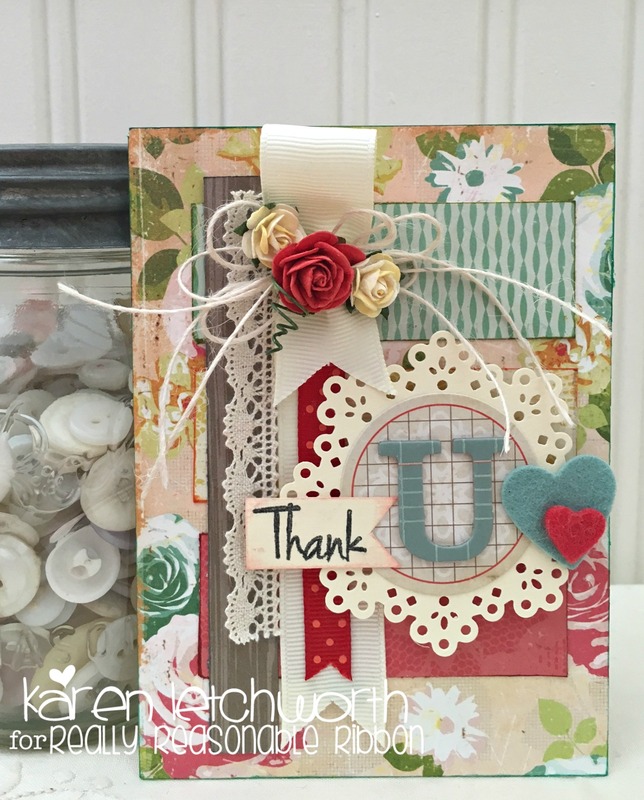 The inspiration for this card goes to the talented Amy Sheffer from a card she shared on Pinterest several years ago. I fell in love with the layout of her card, and it really inspired me. 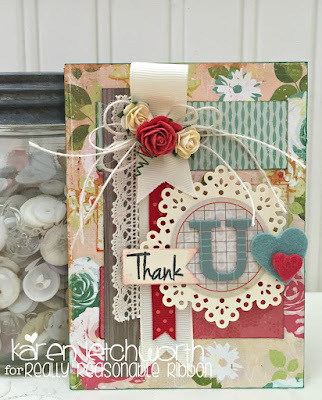 I made my card by using up some older patterned papers and some FABULOUS goodies from Really Reasonable Ribbon. Once I had my patterned papers in place, I added a strip of 1 1/2" Ivory Grosgrain Ribbon that I looped over the top, and tied with several lengths of Ivory Burlap String. To that, I added one Red Open End Rose and two Two-Toned Yellow Open End Roses. I also have a length of Red Swiss Dot Grosgrain Ribbon peeking through, as well as a length of Debra Natural Crochet Lace. Each trim I added just gave my card a little more personality. You can never really add too much ribbon, right? Really Reasonable Ribbon has so many great ribbons, trims, Laces, Mulberry Flowers, Embellishments, and SO much more. You're sure to find something perfect for your next project. There's also a FUN CHALLENGE where you can play along, and we always enjoy seeing your creativity at work. Be sure to stop by the Really Reasonable Ribbon Blog every day for more great inspiration from my talented Design Team-mates. Thanks so much for visiting! Gorgeous card Karen. Beautiful details. The twine bow and cluster of flowers on the loop of ribbon is gorgeous! This is so beautiful, Karen! I really love your mix of patterns and textures. Just gorgeous! Thanks for the mention, too. I'm honored to have inspired even a tiny part of this!! ooooh, Karen! What a beautiful card! I love all your layers, colors, textures and shapes! Such a lovely talent you have of putting different embellishments and papers together to make a cohesive, lovely masterpiece! 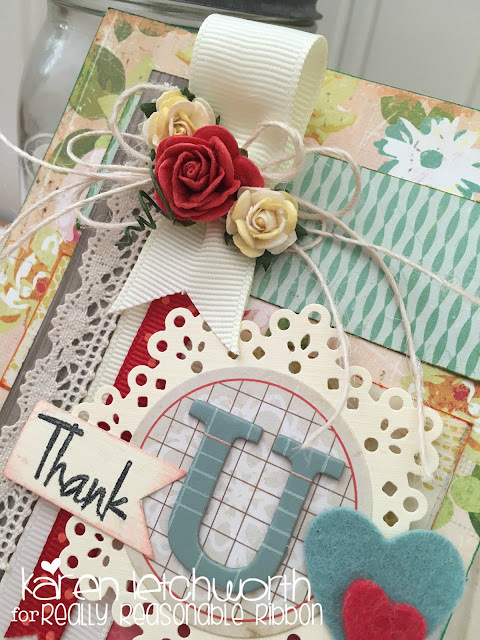 I especially like the looped ribbon with flowers atop, and that darling 'U' with the "thank" banner in front of it! Fabulous card! I love all of the pretty embellishments!Simply beautiful!